Is the Kaze Katana the closest thing to a real Japanese Shinken for under $300? At least in blade geometry and handling? There is no doubt that it is extremely popular. The Kaze dominates in sword dojos worldwide, and dojos tend to try to pick the best value for money Katana for their students.. But that's not why it might be the closest to a real Shinken for under 300 bucks.. Much of it comes from it's design and it's early heritage. The predecessor to the Kaze was the $219 Kanbai Katana by Cheness, a 1045 carbon steel blade with a differentially hardened edge way back from 2005. This was quite revolutionary at the time, and if you have read the review of the Kanbai you'll know it was a tough blade despite being made from the cheapest grade steel on the market. Then Cheness started experimenting with using 9260 spring steel, taking some of this highly resilient steel (similar to 1060, which is the industry standard for tough swords) and clay tempered it. You can see the Kaze and the sword it evolved from side by side below. The experiment was a success. While the sword did not display the kind of sheer durability their non clay tempered swords did - the visible hamon was real, un-etched and raw. But it was a lot more than the real hamon alone that made this sword unique. In this composite review, drawing on the feedback of hundreds of sword buyers, my own personal experience and that of my sword collecting friends, we will take a close look at the Kaze Katana and see why, despite being around for years and years (or perhaps, because of being around for years and years) and certainly being less than perfect, it holds it own against the competition surprisingly well..
Making a traditional Katana with clay tempered hamon under $300 is a hard thing to do. That extra process is not cheap if it is to be done on a decent blade, and this is why the overwhelming majority of swords with real hamon are well over the $300 price point. Swords like the Kaze, the Hanwei Practical series and others seen here are the exception other than the rule. Things have improved fittings wise since the Kanbai Katana - though not by a whole lot.. The blackened steel tsuba is probably the most visually interesting part of the Kaze. Naturally, being steel it is quite strong. But it is let down by a boring cotton wrapped handle, average rayskin (though at least it is real) and darkened brass fittings. From an aesthetics point of view, it's all really quite ugly. But from a functional point of view, it's fine - not quite as good as Hanwei's all iron fittings - but Cheness don't make their own fittings, they have to take what they can get as their forge specializes in making blades..
Of course, a sword is only as good or as strong as it's weakest point - and that is probably, like all production swords, the tsuka. 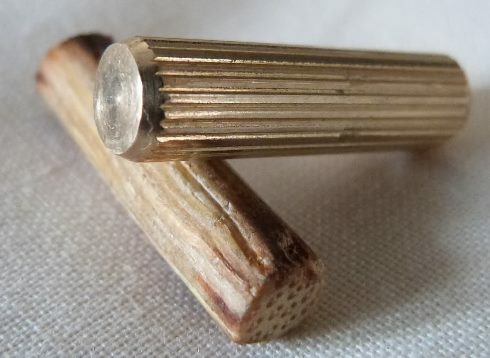 Traditionally, the tsuka were custom made to fit the tang like a glove, and were secured with a single mekugi pin. Of course, to do this properly takes the kind of TLC that would push the price up through the roof - so Cheness have done the next best thing and secured it with two mekugi, though following the advice of a high ranking Japanese sword art Sensei, replaced the rear one with brass.. This creates an extra level of security and is an economical solution to a complicated problem. In short, the fittings are functional - but hardly pretty. The blade however, is a different story..
As mentioned, the cutting edge of the Kaze Katana has been hardened using a traditional method that involves applying clay to the back and quenching the blade so that the edge cools faster than the spine. The advantages to this technique are that, because the edge is harder, it is able to have and to keep a much sharper, keener edge - not to mention as a by product it has a natural hamon (temper line), a much sought after feature that is common to all traditionally forged Katana. The downside is that the clay covering the spine prevents the back of the sword from being thoroughly hardened, leaving it in a slightly softer state than the cutting edge. This two tone effect means that if you bend it hard, the Kaze - like all traditionally forged Katana - will take a permanent set. 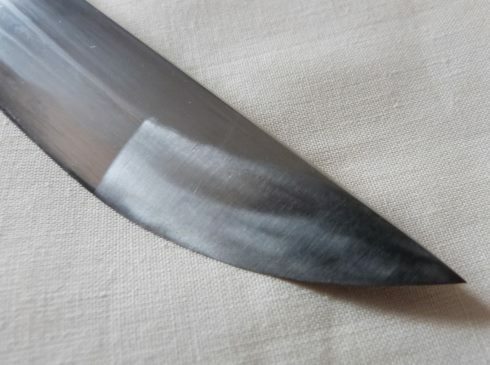 But the use of thick 9260 steel with a solid Hira Niku (literally 'meaty') profile minimizes the risk of a permanent bend on a normal cut as much as possible, making the Kaze one of the most durable traditionally forged Katana on the market, less likely to chip or break - a good compromise in my opinion. Perhaps one of the things that sets the Kaze apart from most other sub US$300 swords is it's striking, un-enhanced natural Sughata (straight style) hamon line. The polish level on the blade is higher than the rest of the Cheness Cutleries series to bring out it's natural beauty, and it does seem that the 9260 steel reacts well to the claying process. However, there are two areas that I feel that the Kaze is let down by - one is the finish of the kissaki, which in the right (or wrong) light the cheap counterpolish looks quite hideous when compared with the rest of the blade (but is perfectly servicable). Probably the only part of the blade that has less than an ideal polish.. The other is the straightness of the blade. I'm not sure if it is a property of 9260 spring steel, but often the sword pulls very subtly to the left or to the right when you lay it down on a flat surface. Usually it's not really noticeable to the naked eye nor enough of a bend to effect cutting - but it is often there just the same. 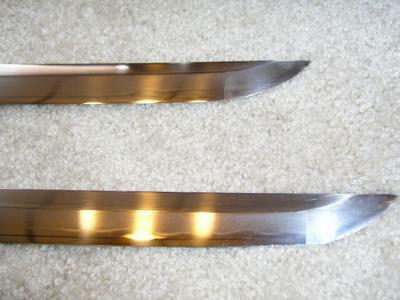 The plus side is that because differentially hardened Katana do tend to be bendable, it's easy enough to fix (much harder with their through hardened blades though, which tend to spring back to true even if true is slightly off center) and I would not let it put you off because the other features of this blade make up for it. Notably, it's blade geometry and sharpness. What's strange is that the Kaze, because of the appleseed hira niku profile, has an odd kind of sharpness to it. 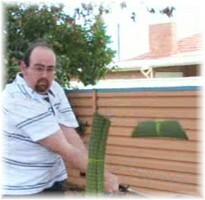 Thumbing the blade does not reveal how well these swords can cut (but running your thumb ALONG the blade - i.e. 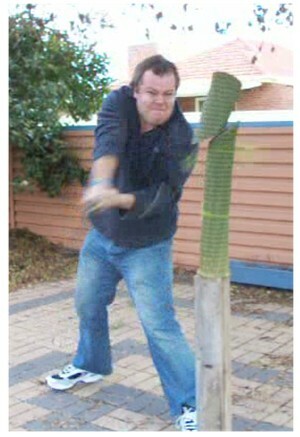 following the way a sword SLICES - certainly will, as I found out the hard way! Can we say 'ouch!'). The way I found out about it's sharpness was with a paper cutting test, done with the blade as it comes straight out of the box, cutting A4 paper suspended in mid air (the paper suspended in the air, not me that is). I think this is made all the more impressive because with so much meat on the blade and a weight of 2lbs 9oz, it can still reach the optimal cutting velocity with ease. I've tested the Kaze on a lot of different targets - but bear in mind, as it's a traditional blade specialized to cut targets that approximate human flesh and bone, it's not very versatile. Try cutting a tree branch with it and unless your technique is perfect, you'll bend it out of shape. Try cutting a tatami mat with it though, the traditional approximation of a human limb or neck, and it comes alive.. Which is more than I can say for the Tatami..
VIDEO: The Tatami Killer In Action! The Kaze truly is a 'Tatami Killer' - you can see how clean the cuts are on a single rolled mat. Here's another video by my friend and SBG reviewer Tom Kinder showing how the Kaze performs on a wide range of targets.. The Kaze made short work of everything put in front of it..
Much of the Kaze's cutting ability comes not just from the way the edge is sharpened but rather from the subtle shape and geometry of the blade design itself and the way it is balanced. In Tom's words "subtle differences in blade shape and design make a HUGE difference in the performance of a blade"..
And I think this is what makes the Kaze the sword closest to a real Nihonto.. It's not a light cutter. 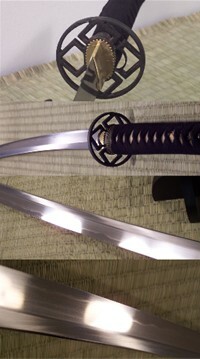 Historically Katana came in many different types of weights and balances. Some were light and fast, but the Kaze is not one of these. But pick it up and you can feel that it is optimized for the cut.. The Kaze is not an art sword, though it has a beautiful natural hamon. It is instead a workhorse. And since it's development in 2006 thousands have been sold worldwide so the forge has got quite good at making it..
After receiving the sword, you can adjust the components, add a high-grit diamond paste polish... etc. to make it as refined as you choose. However, these are not the features we strive for and should not be expected of the sword out of the box. If a highly refined sword is what you are after, you will either need to be prepared to perform these refinements yourself or should purchase a higher end sword from a different manufacturer. This is precisely what many Kaze owners can and have done, and the results are often stunning because the base sword itself is a solid platform. Take a look at how clear the hamon becomes after a good hybrid polish. Yes, the Kaze is an excellent sword - reliable, readily available and solidly put together. It's not without it's flaws, but it is a sword that has stood the test of time, got the design right from the beginning and there are not too many swords anything like it in the same price range. So it's hard to recommend anything else. As a result, the Kaze Katana is a great choice for the beginner and experienced cutter alike. It's keen blade ensures that if you hit a target right - you will cut it. And the extra resilience of the 9260 spring steel blade means that even if you botch up your hit, your chances of taking a set (bend in the blade) or a chip are practically non-existant. 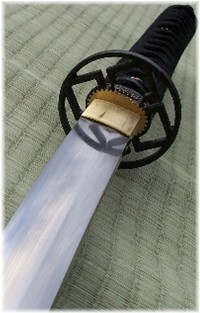 Soon after I tested the Kaze out for myself I started selling it here at the SBG Sword Store. 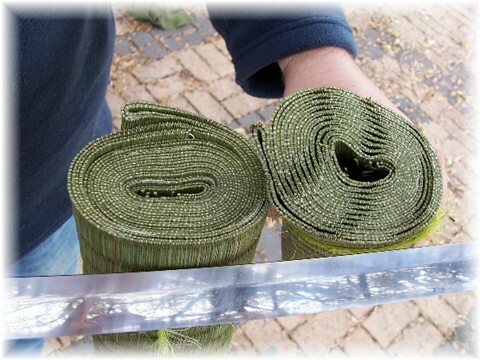 Over the years, we have sold hundreds of these swords and they have an exceptionally high customer satisfaction rate. Even after all these years, we have squeezed our margins to keep the Kaze down to $299.99. There is not much profit in these (if it was about money we would change to a higher profit sword) - but it's a sword I can stand behind and comfortably recommend. Do you have this sword? Want to let others know what YOU think? If you bought this sword, either before or after reading this review, be sure to let others know what you think - share your own impressions here! Got My New Kaze Today!!! If I had to describe the Cheness Kaze in one word, it would be: "Breathtaking"
Great sword for the price! Amazing website!!! Kaze is great.. Got a peice of my thumb showing a friend a cut on paper.. Sheesh this thing is sharp.. Robbers, beware!! I have 3 Kaze and they are a work of art !!!! This Kaze is everything I had hoped for - Thanks Paul S.
Nothing else in this price range comes CLOSE...!